Since we purchased our house with the thought of renovating every room/space, it can be tempting to wait to make any changes to a room until we are ready for the full overhaul. The problem with waiting is that our house was feeling so empty & boring. One day, I made the decision to start putting up any wall decor I had in boxes and not worry about if it's going to stay there forever. I literally walked around the house with a box of picture frame nails and hammer. If I have to fill a couple of nail holes when we paint the room, it's not the end of the world. 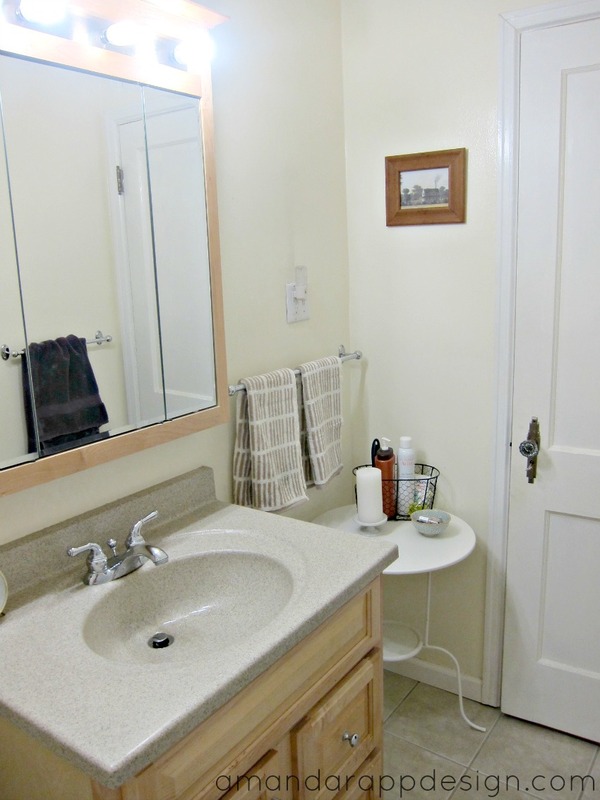 This is the photo from the real estate listing of our main bathroom. It is livable as is but definitely room for improvement. 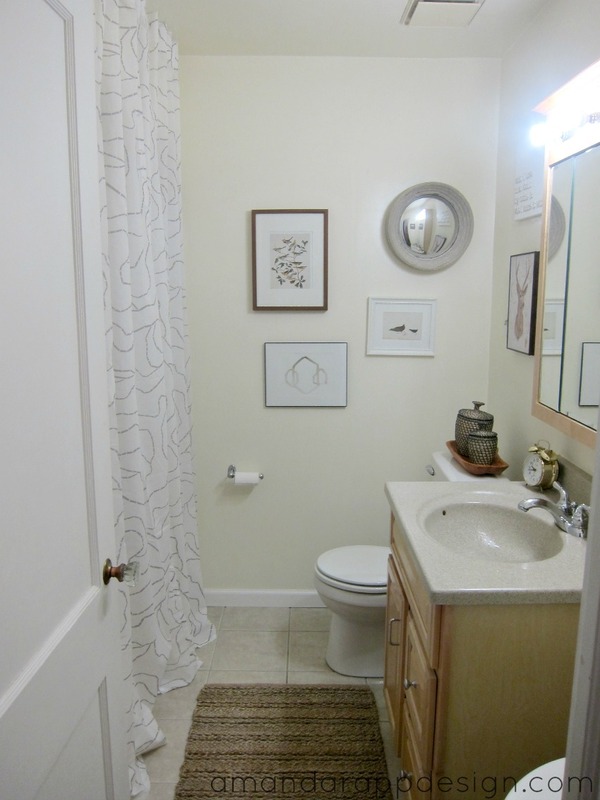 This space needed some decorating and style desperately! 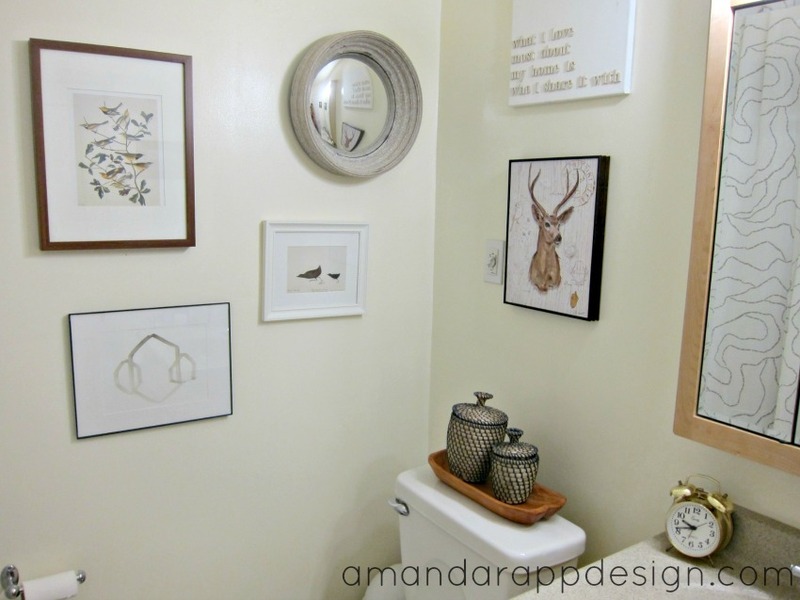 I added some random pieces into a gallery wall, cute storage containers, a textured rug, and a tall shower curtain. The little containers are from IKEA that hold q-tips & cotton pads which I use to take off my makeup. I can't remember where I found that wood tray, it was somewhere sort of random, maybe Meijer? This bathroom looks to have renovated sometime recently, maybe 5 years ago or so. The previous owners didn't really think about optimizing the layout and left about 26" of dead space in this corner. 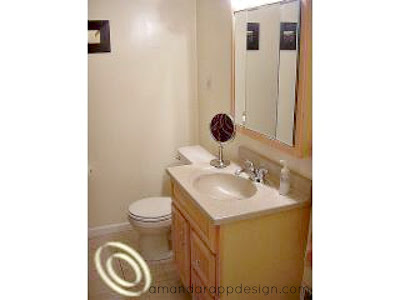 A little table for now helps to provide more surface space but I would like to see a double sink vanity in here. The light switch is also in the weirdest spot, so difficult for guests to find it. When we do start this renovation, I am planning on removing the bulkhead in the shower and adding some pot-lights to bring in more light. I'm obsessed with using normal curtain panels as a shower curtain - more options to choose from but more importantly is the longer length. These ones are from IKEA and are super long. 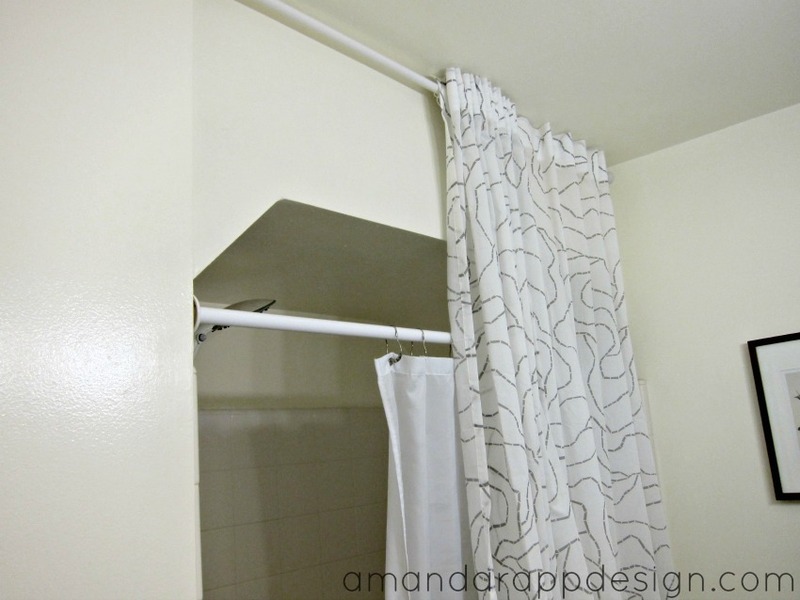 This is my favorite design trick to use in a bathroom with a shower curtain, it always amazes me how tall the room feels when you bring the curtains to the ceiling. Normally I would just get an extra long shower curtain for the inside and only have one curtain rod, but this works for now. I could probably add a few more things since there's so much empty wall space still but I don't want it to feel too cluttered. Almost all of our art, mirrors, and paintings are now scattered through the living spaces. Sometimes the smallest changes can really make a big difference. It's better than before and helps to keep me happy until time & budget permit for the full renovation. Any quick changes or decorating tricks you'd like to share? Hi. I'm Amanda! Click above to learn more.